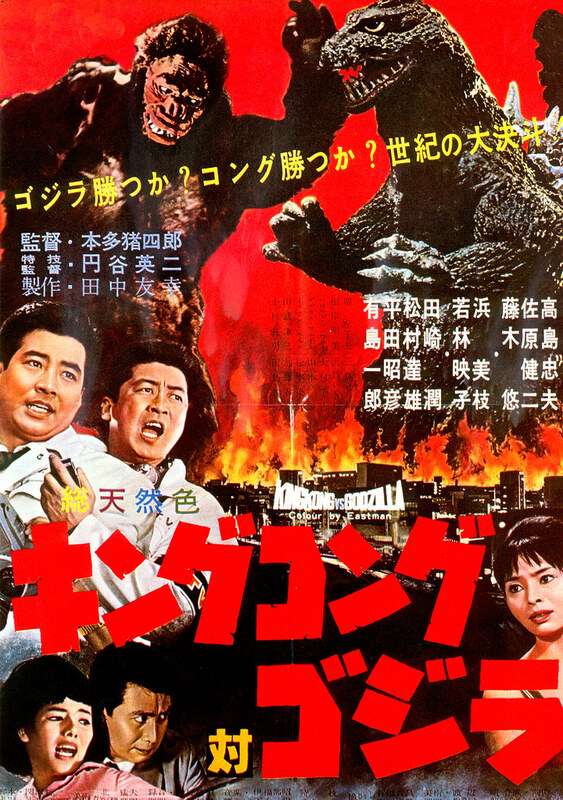 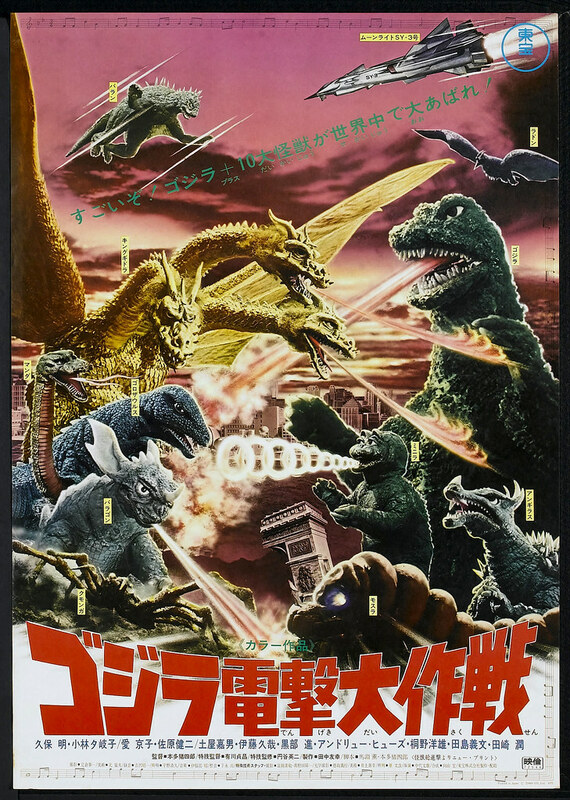 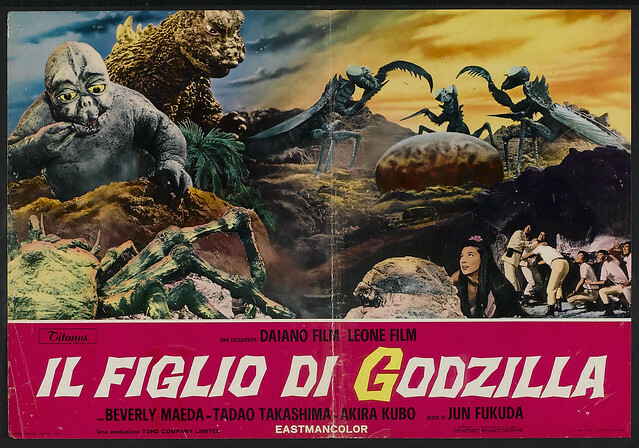 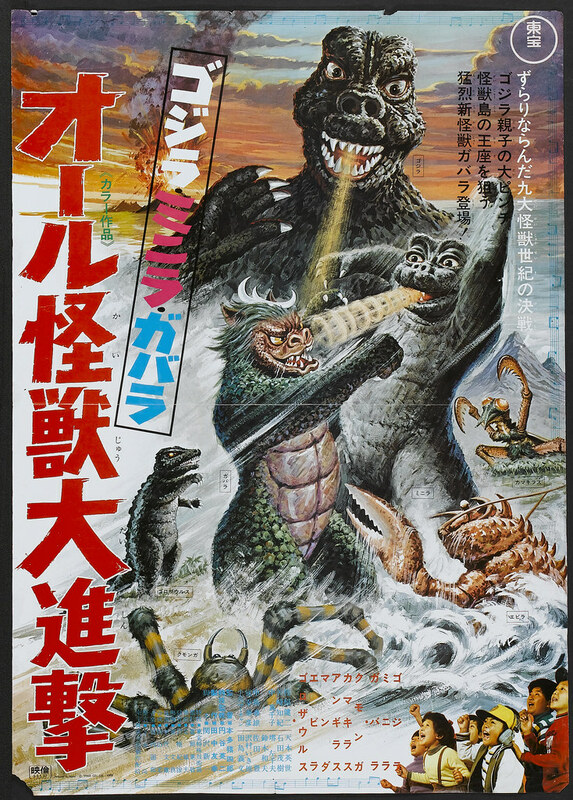 Released in Japan as Godzilla, Minilla, Gabara: All Monsters on Parade and America as Godzilla's Revenge. 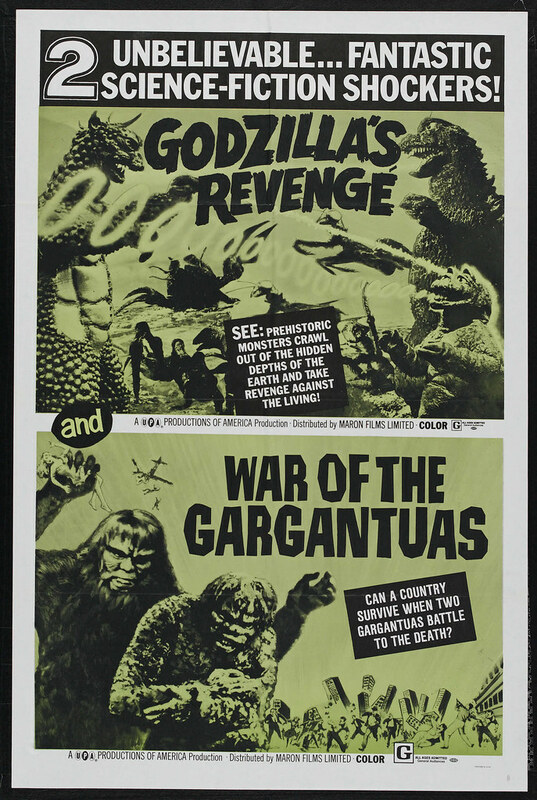 I like how the second poster implies with the phrase "Revenge Against The Living" that Godzilla is a zombie. 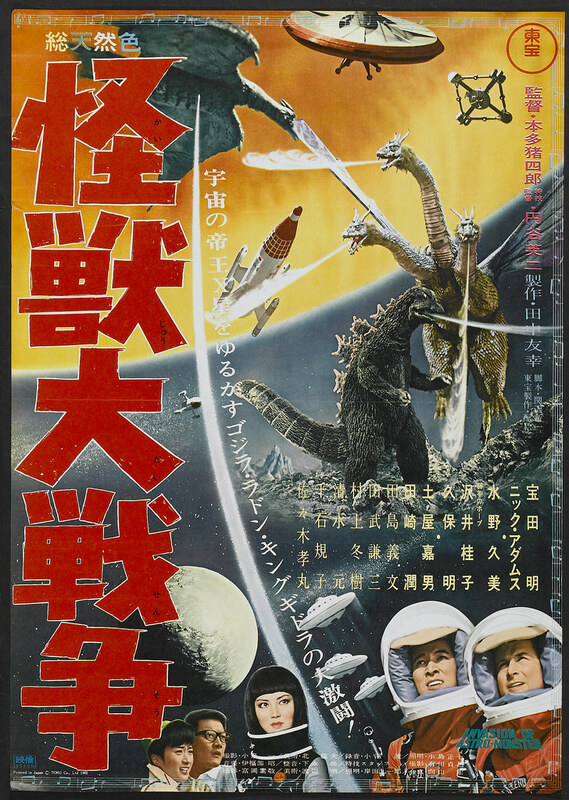 Read about the film on its Wikipedia page. 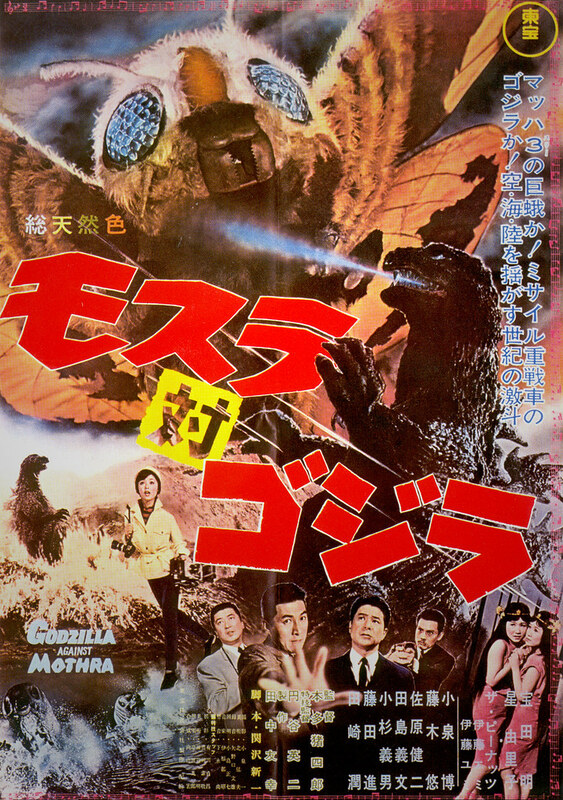 Released in Japan as Attack of the Marching Monsters, read more about the film on its Wikipedia page. 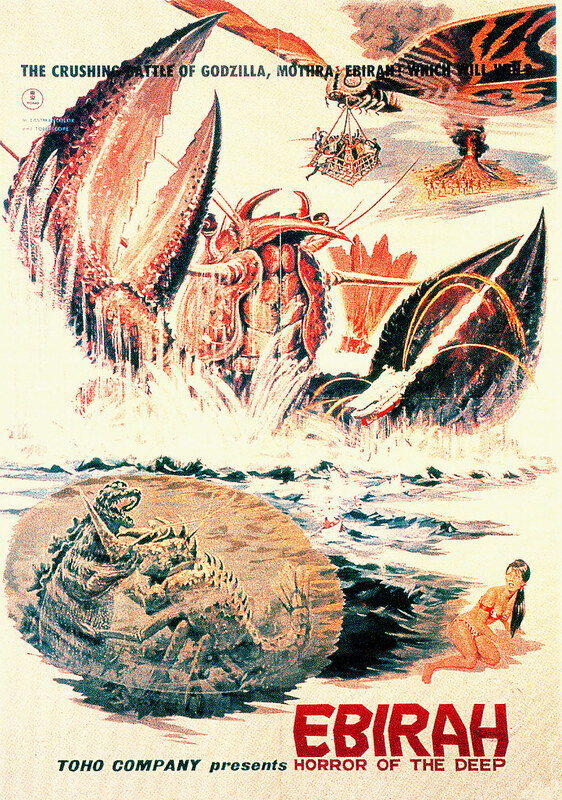 Details on the film can be found on its Wikipedia page. 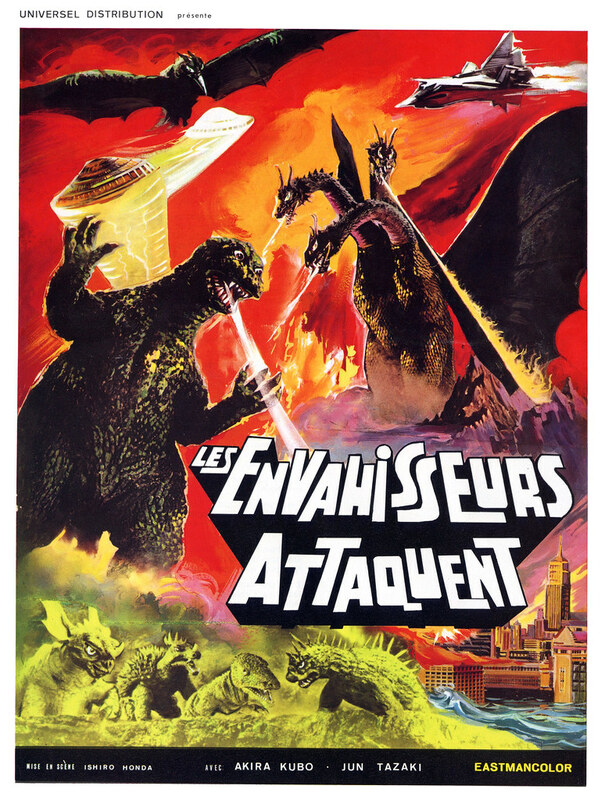 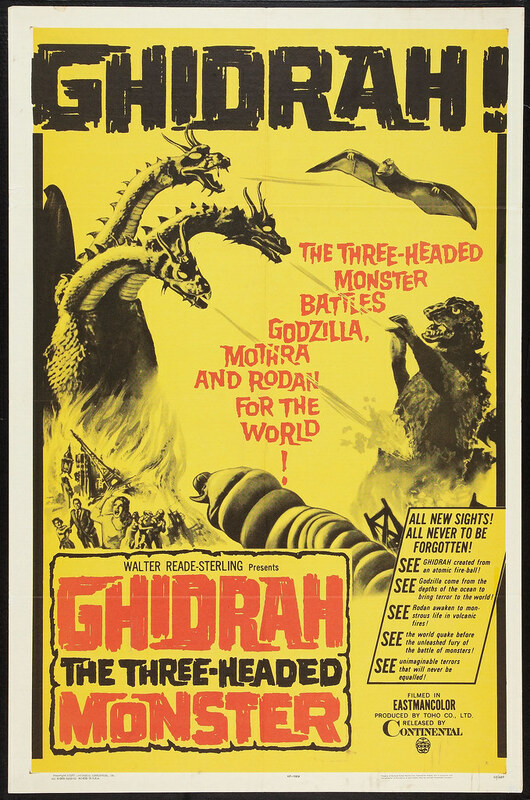 Other titles include Ebirah, Horror of the Deep and Godzilla, Ebirah, Mothra: Big Duel in the South Seas. 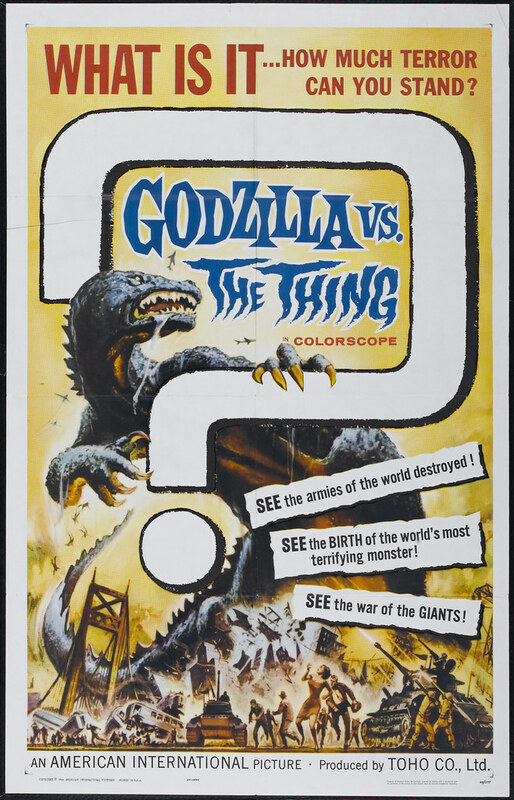 Further details can be found on the Wikipedia page for the film. 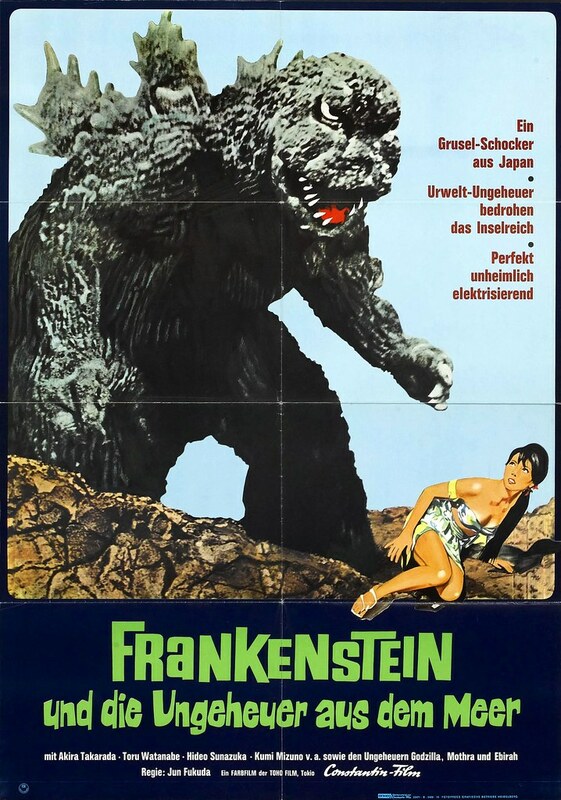 The bottom poster with the Frankenstein title originates from Germany. 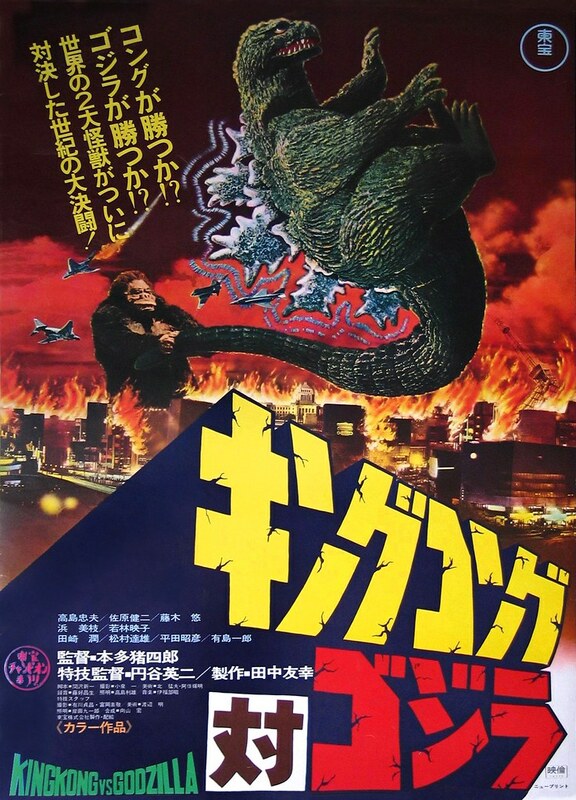 There seems to be a lot of Godzilla films from Germany with the Frankenstein name on them, no idea why. 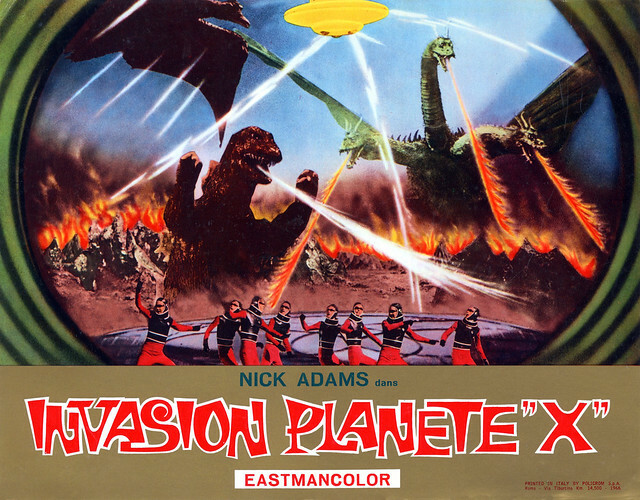 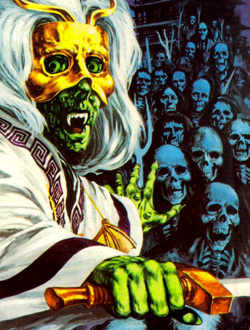 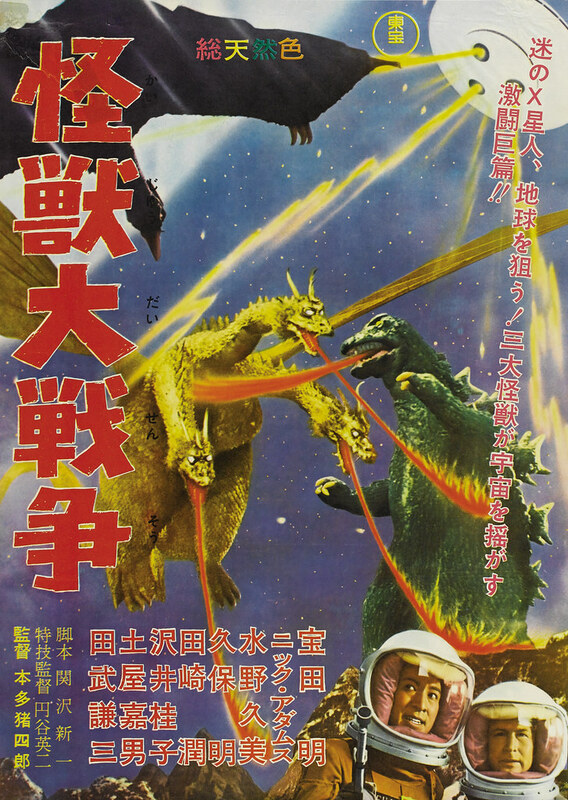 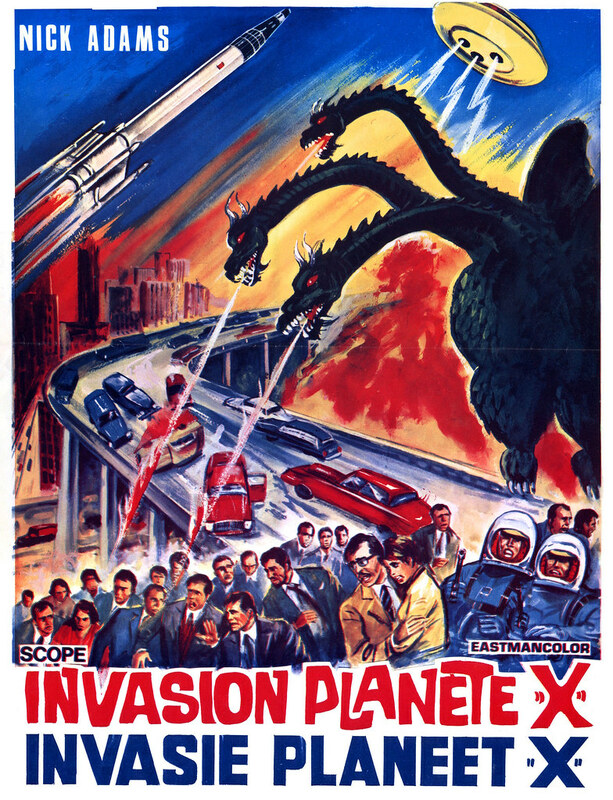 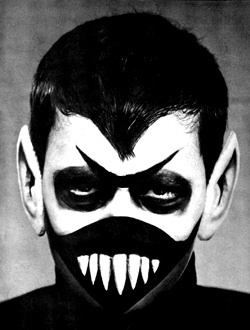 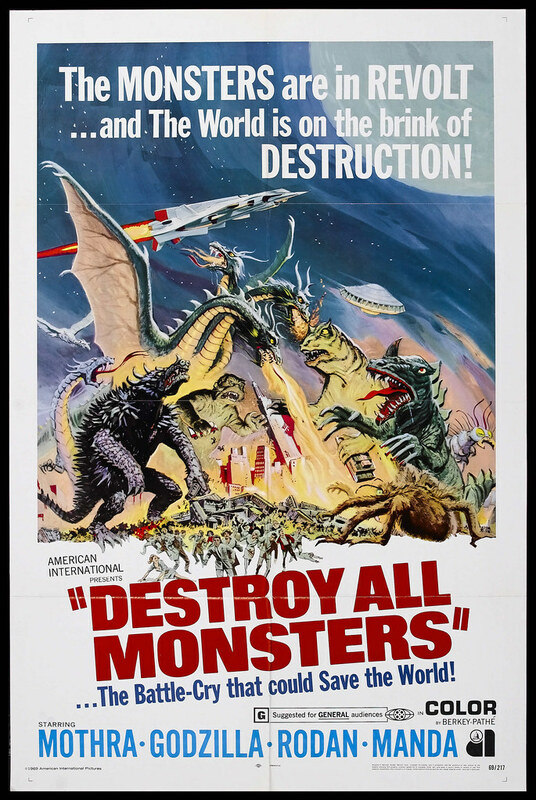 Other titles include Invasion of Astro-Monster, Great Monster War, Monster Zero and Invasion of the Astro-Monsters. 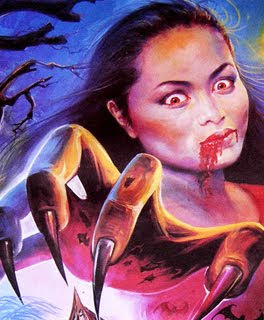 Read about the film on its Wikipedia page. 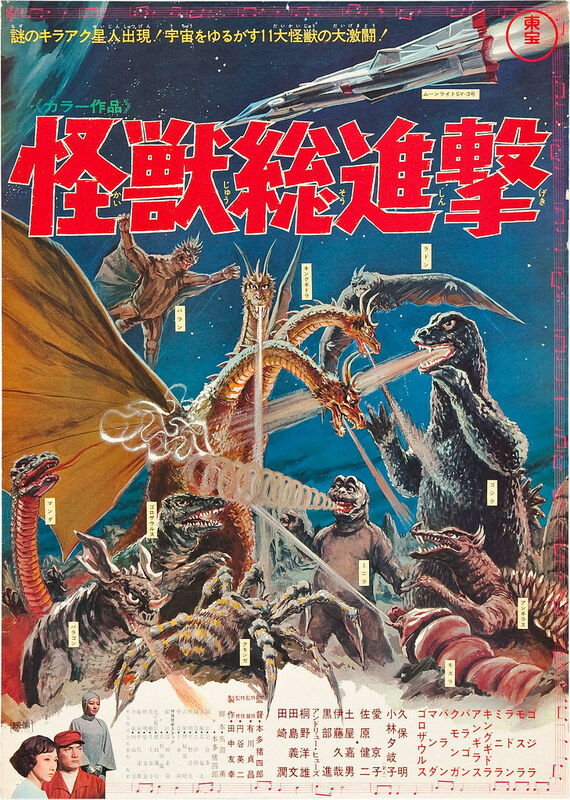 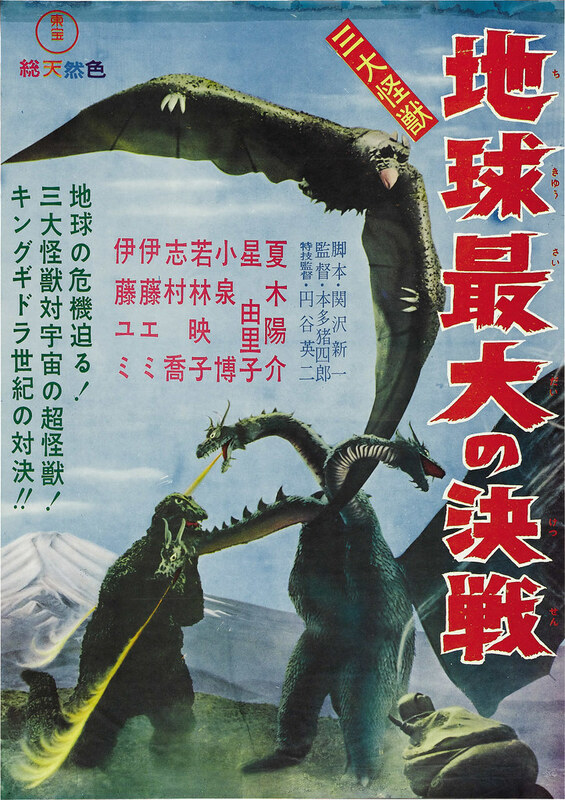 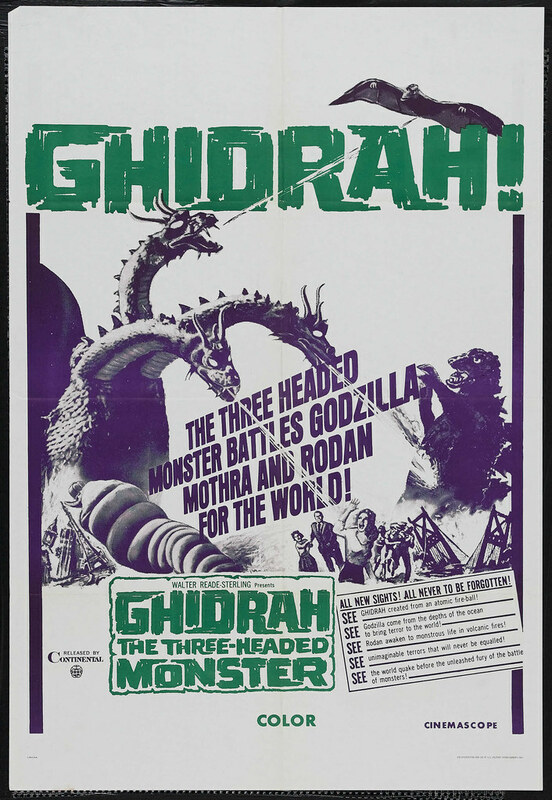 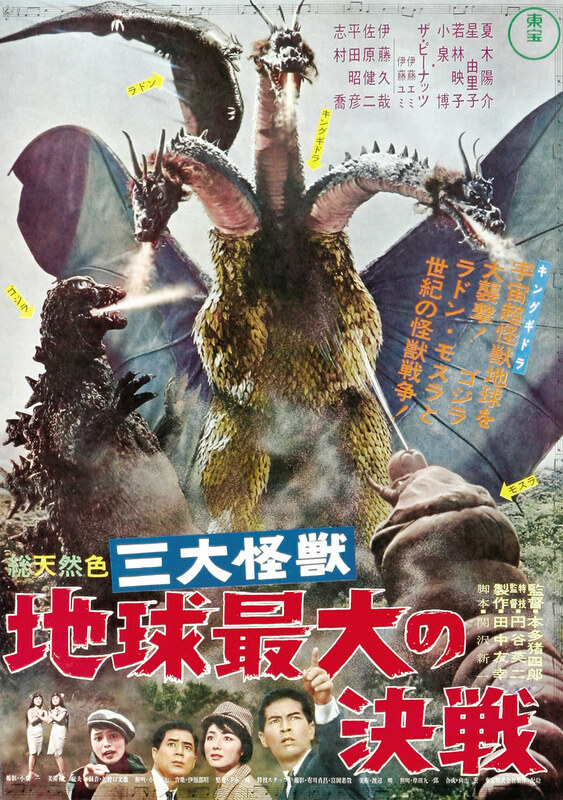 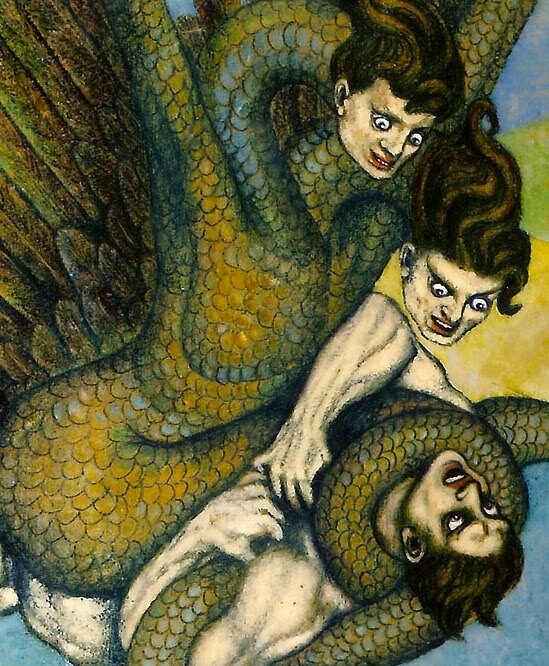 Titles include Ghidorah, the Three-Headed Monster, released in Japan as Three Giant Monsters: The Greatest Battle on Earth and released in the US as Ghidrah, the Three-Headed Monster. 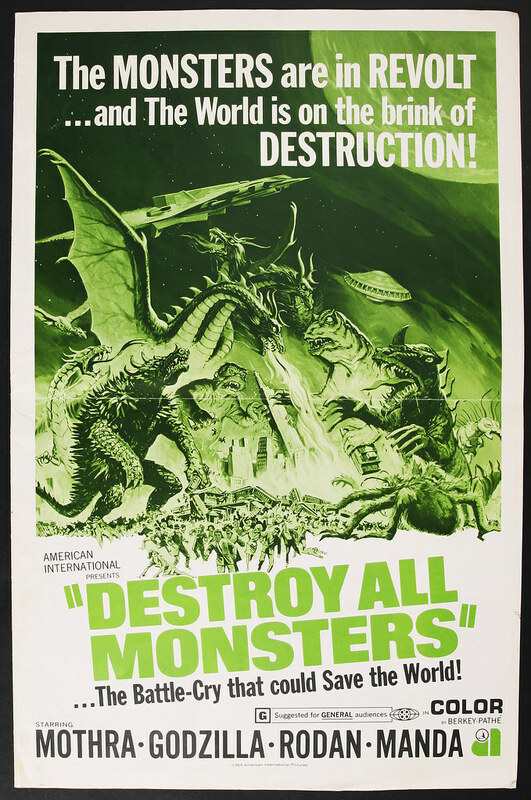 Read about this film at its Wikipedia page. 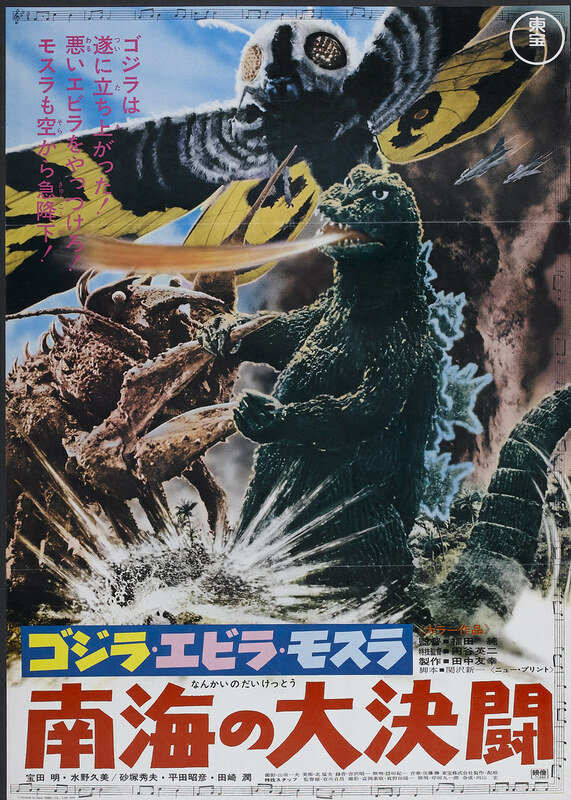 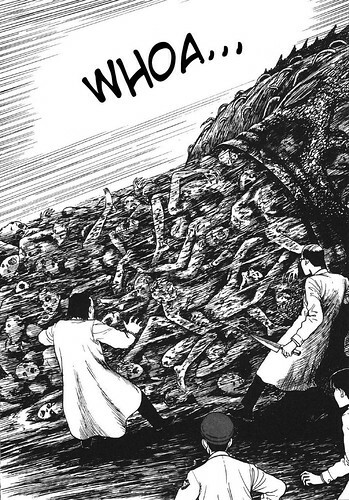 Also known as Godzilla Against Mothra, Godzilla vs. Mothra, and Godzilla vs. the Thing, It's interesting that the American release of the film advertised a monster simply called "The Thing" and hinted that it was some insane tentacled beast. 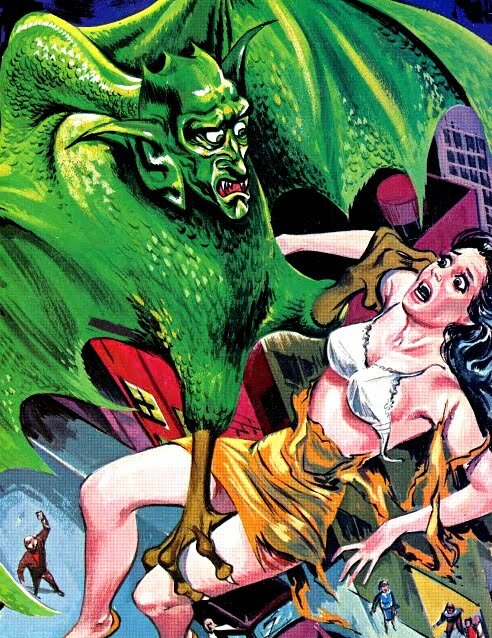 I'm guessing the promoters thought that looked better than a giant moth. 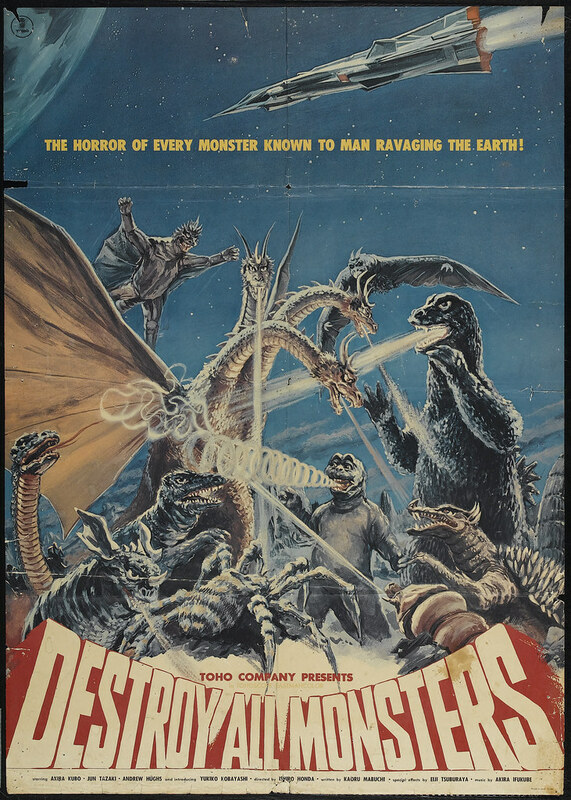 Read more about the film at its Wikipedia page. 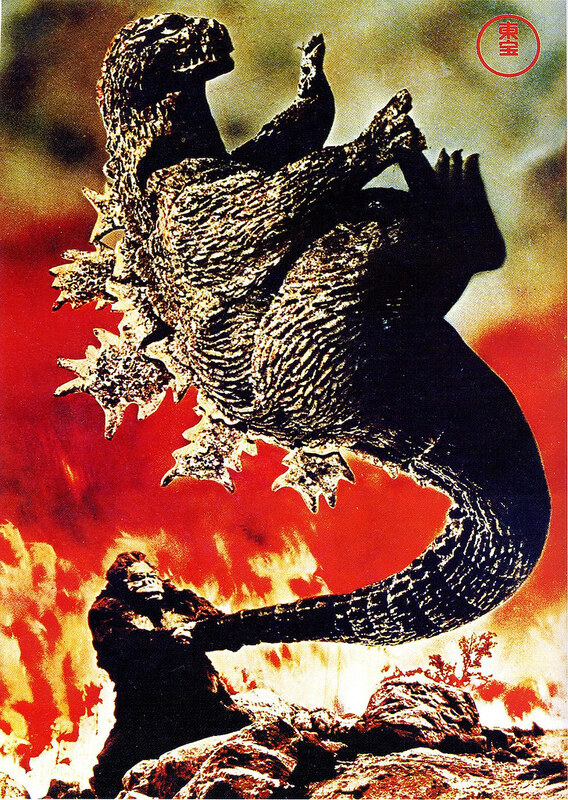 The third Godzilla film was originally going to be a true sequel to King Kong, with Kong going up against a giant Frankenstein. 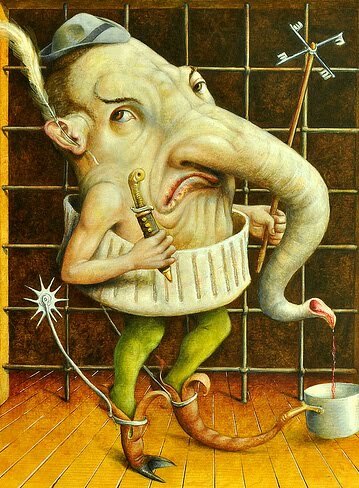 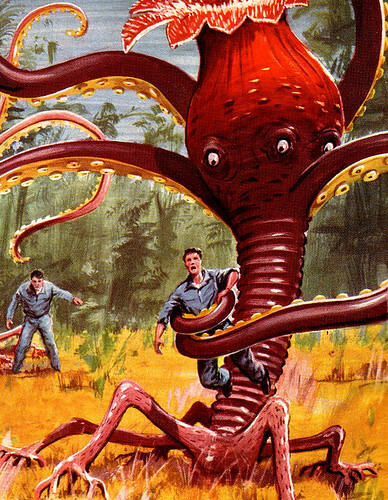 It had the involvement of Willis O' Brien and would have been an amazing stop motion feature film. 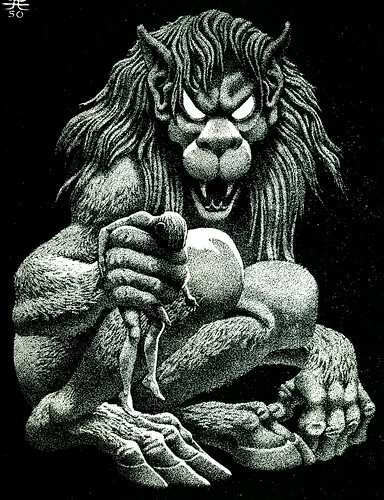 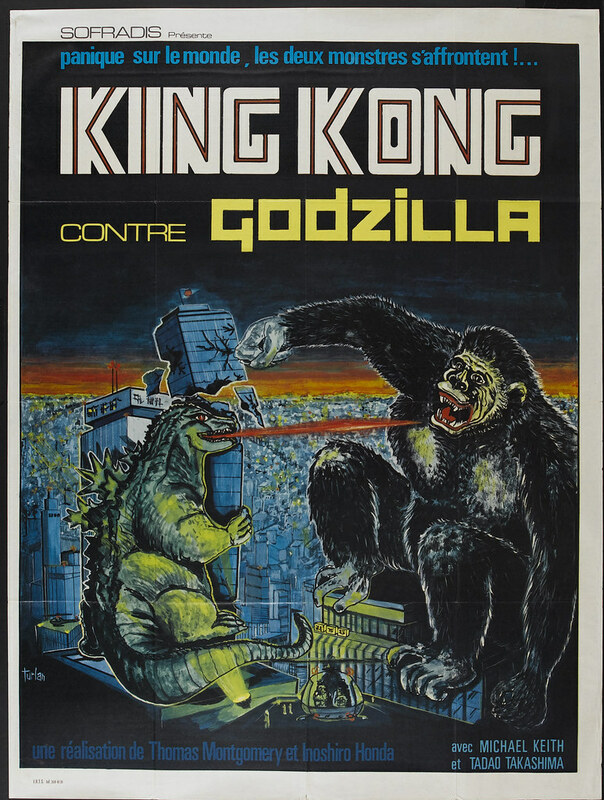 Unfortunately things didn't turn out that way as the following quote from Wikipedia details..
"The film had its roots in an earlier concept for a new King Kong feature developed by Willis O'Brien, animator of the original stop-motion Kong. 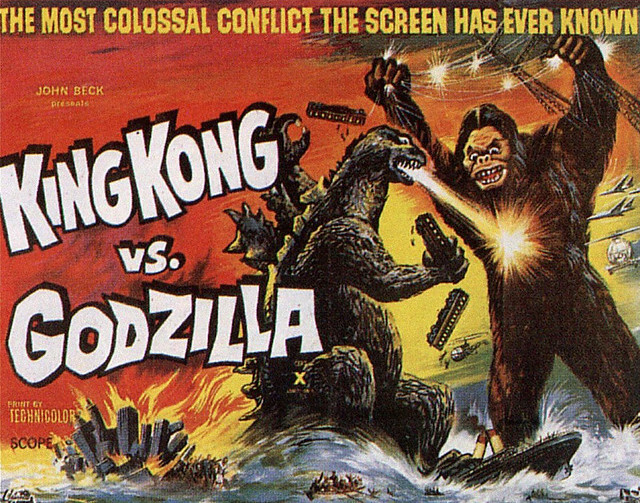 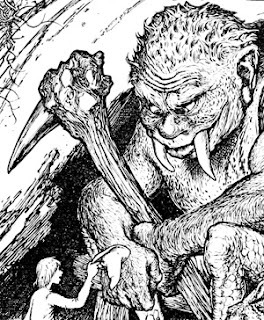 Around 1960, O'Brien came up with a proposed treatment, King Kong vs. Frankenstein, where Kong would fight against a giant version of Frankenstein's monster in San Francisco. 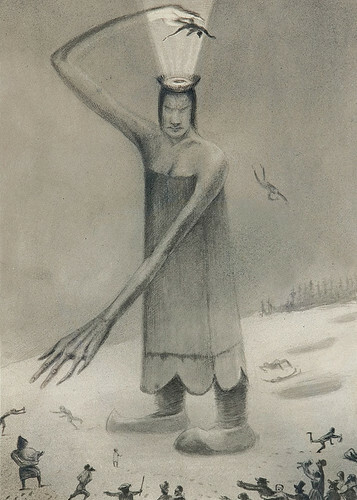 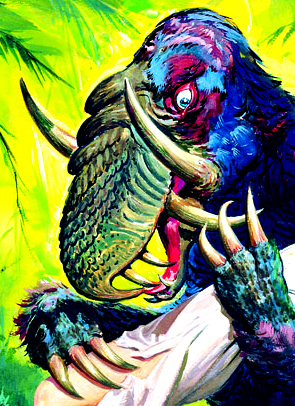 O'Brien took the project (which consisted of some concept art and a screenplay treatment) to RKO to secure permission to use the King Kong character. 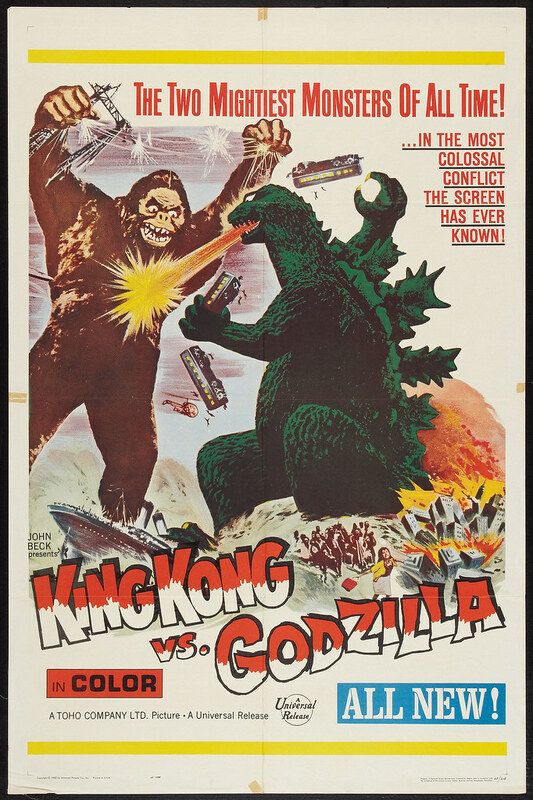 During this time the story was renamed King Kong vs. the Ginko when it was believed that Universal had the rights to the Frankenstein name (they actually only had the rights to the monster's makeup design). 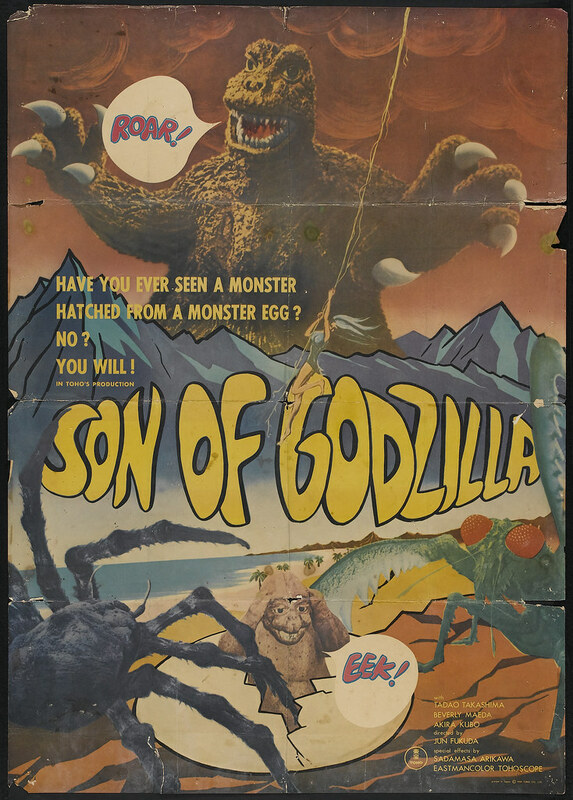 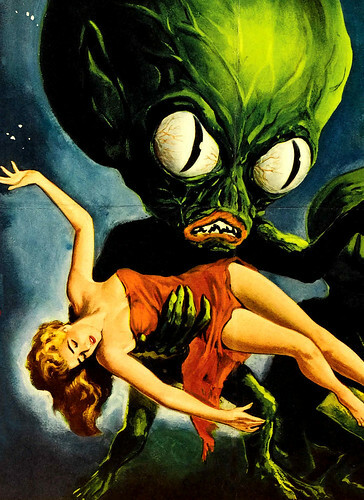 O'Brien was introduced to producer John Beck who promised to find a studio to make the film (at this point in time RKO was no longer a production company). 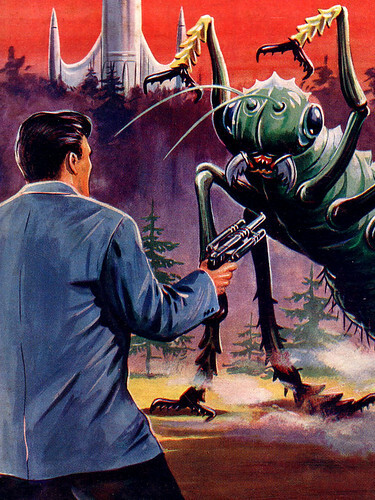 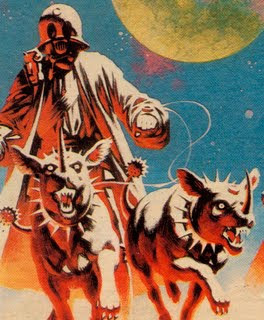 Beck took the story treatment and had George Worthing Yates flesh it out into a screenplay. 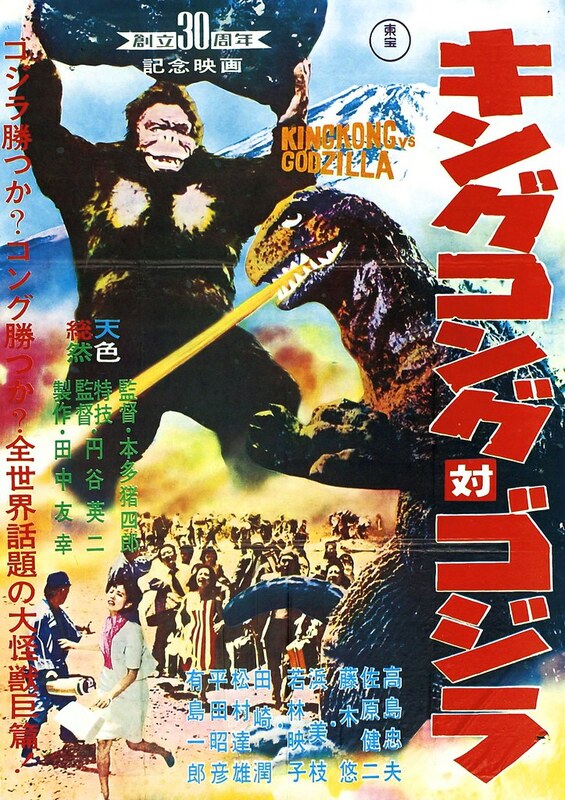 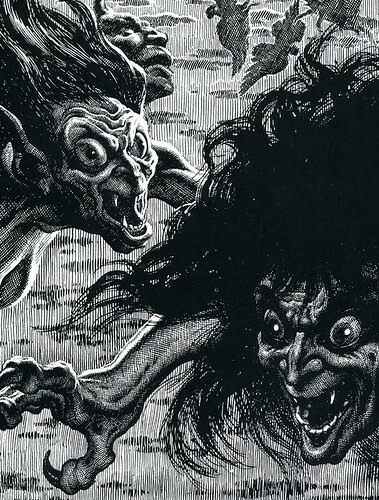 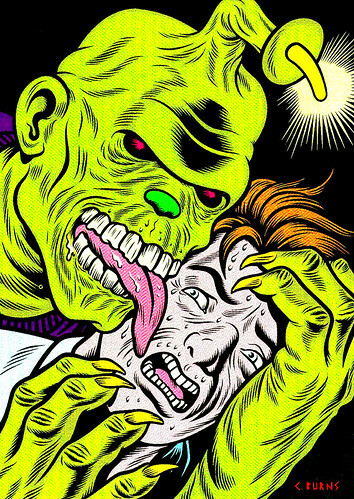 The story was slightly altered and the title changed to King Kong vs. Prometheus, returning the name to the original Frankenstein concept (The Modern Prometheus was the alternate name of Frankenstein in the original novel). 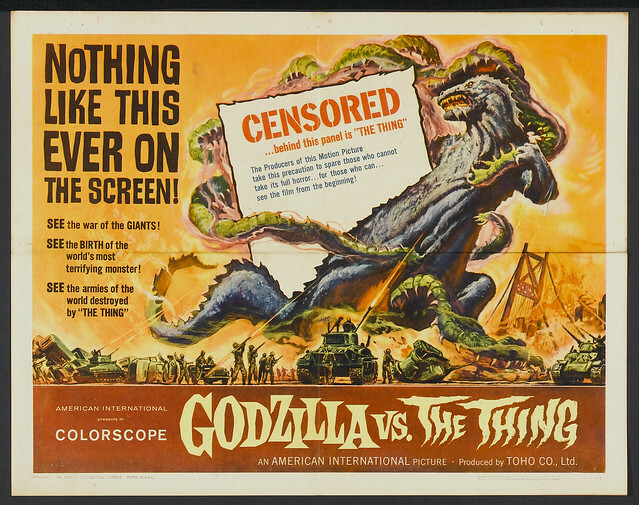 Unfortunately, the cost of stop animation discouraged potential studios from putting the film into production. 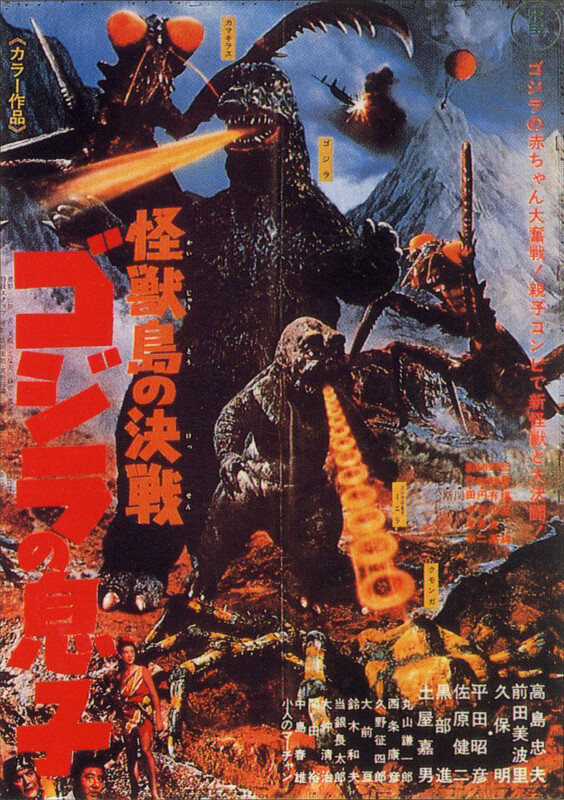 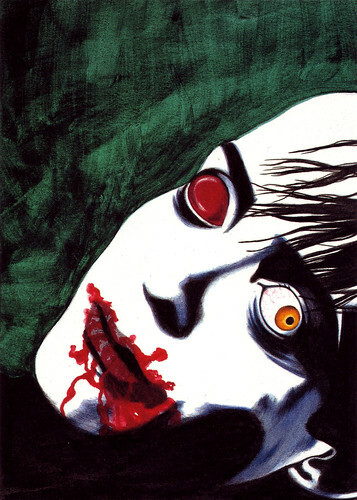 After shopping the script around overseas, Beck eventually attracted the interest of the Japanese studio Toho. 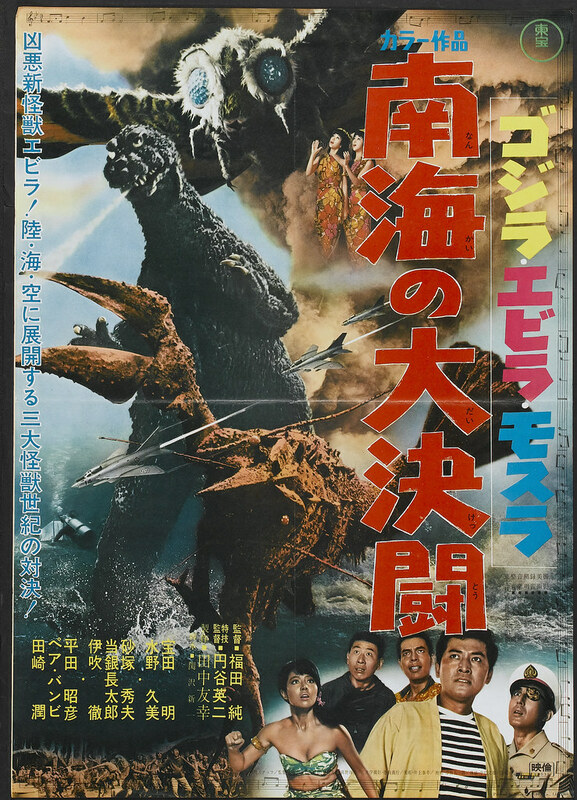 Toho had long wanted to make a King Kong film and decided to replace the Frankenstein creature with their own monster Godzilla. 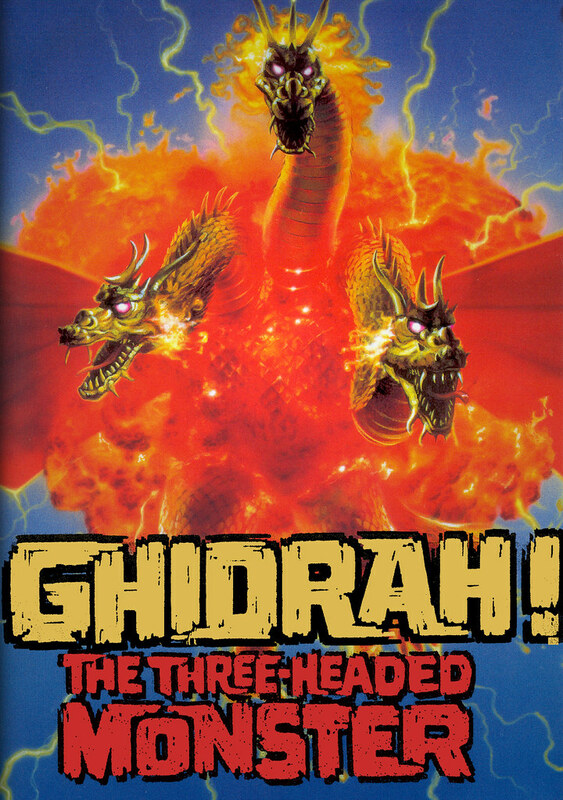 They thought it would be the perfect way to celebrate their thirtieth year in production. 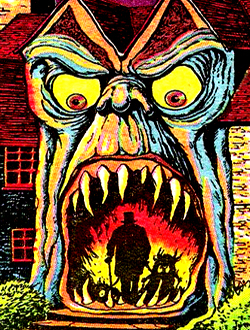 John Beck's dealings with Willis O'Brien's project were done behind his back, and O'Brien was never credited for his idea. 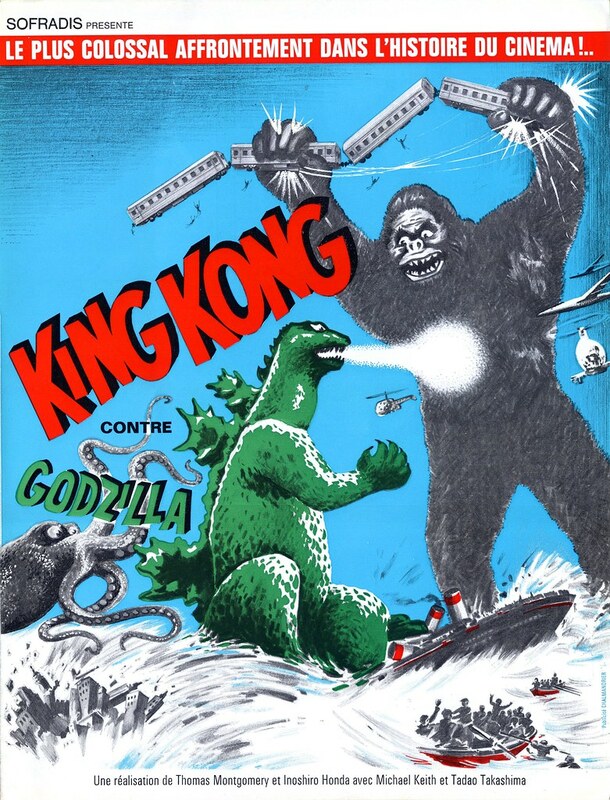 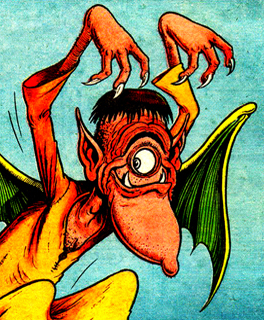 In 1963, Merian C. Cooper attempted to sue John Beck claiming that he outright owned the King Kong character, but the lawsuit never went through as it turned out he was not Kong's sole legal owner as he had previously believed." 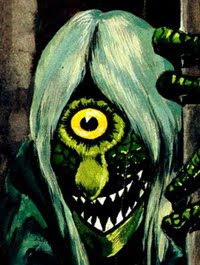 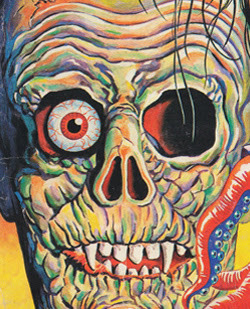 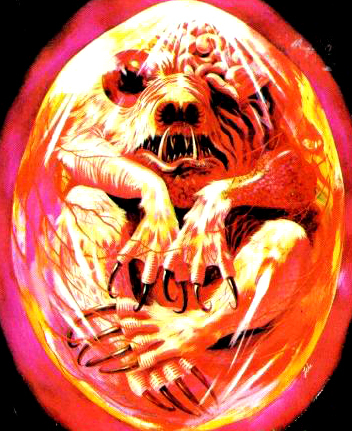 Check out this previous Monster Brains post to see some of the Willis O'Brien concept art from the film.